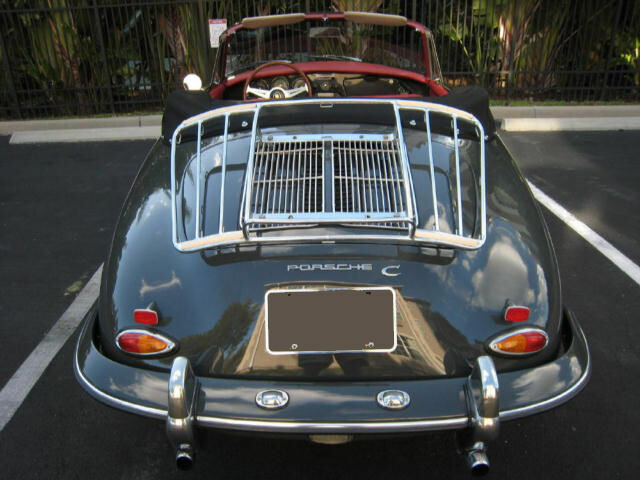 Three Styles of Factory Accessory Luggage Racks! 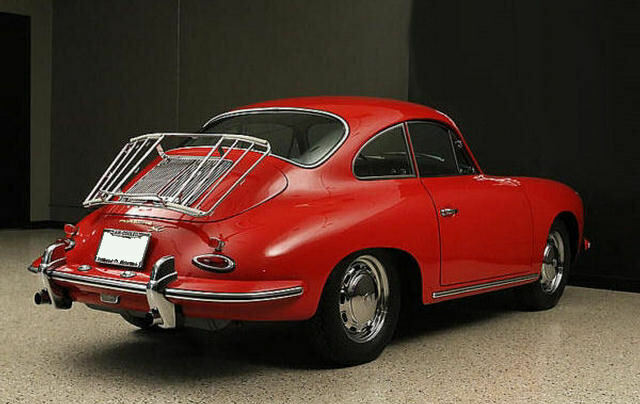 There have only been three basic styles of factory accessory luggage racks for 356 Porsches, not counting the variations of some for single grill vs. dual grill models. 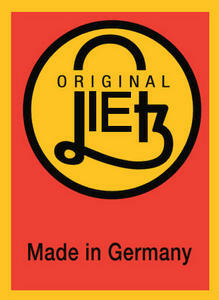 The first two were made by Reutter, and the third by Leitz. Some were painted silver, some were painted the color of the car, and some were chrome plated. 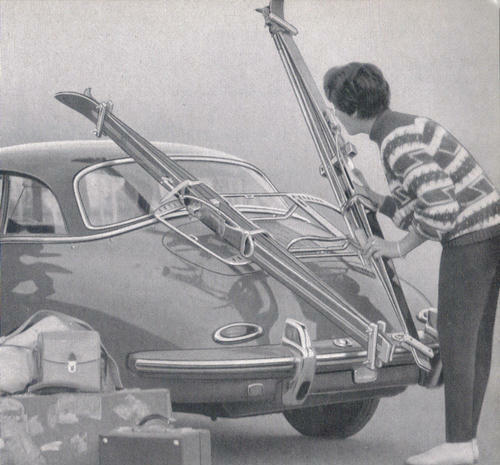 There were, of course, many aftermarket luggage racks available for 356 Porsches, perhaps the best known being the Amco Travel Rack. 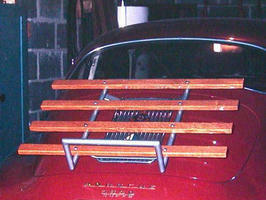 And there were all the home made luggage racks as they are not that difficult to build. 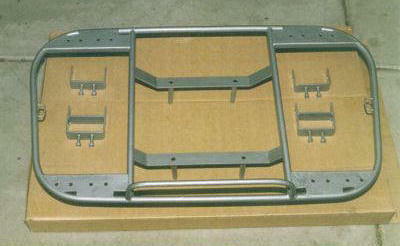 This website will track the timing of these various factory accessory luggage racks and the differences between them. 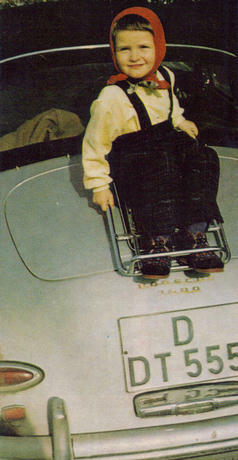 The Early Reutter Luggage Rack! 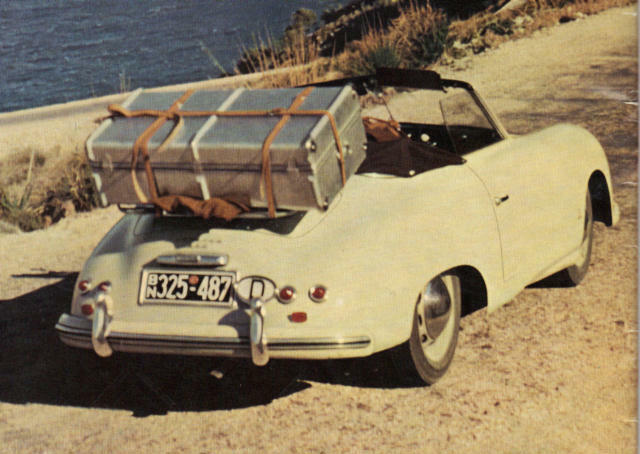 Were Luggage Racks an accessory for 356 Pre-A Porsches? It appears that they were, at least based on the brochure shown below. And a familiar name was the manufacturer, Reutter. 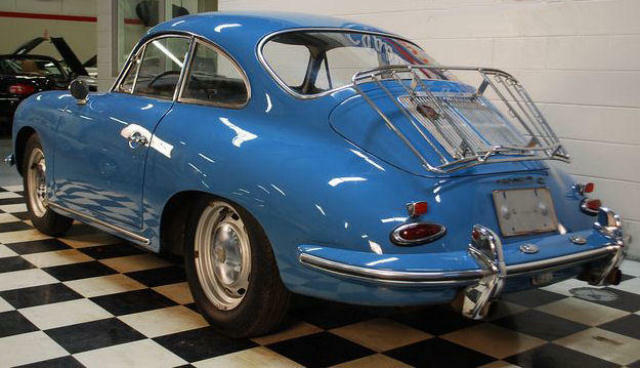 You know the name Reutter, they built 356 bodies for Porsche beginning in the early 1950's. 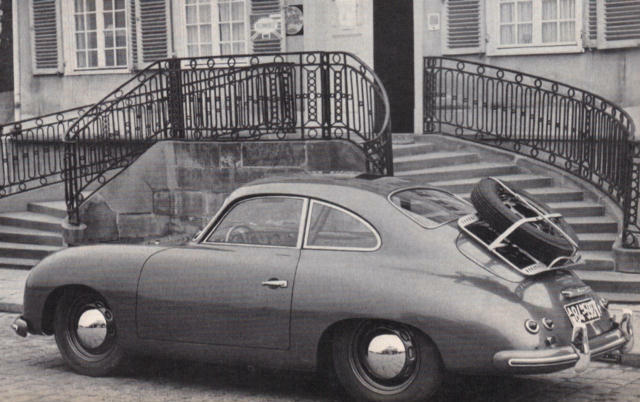 In fact, when Porsche moved to Stuttgart-Zuffenhausen in 1950 they occupied building space rented from Reutter. 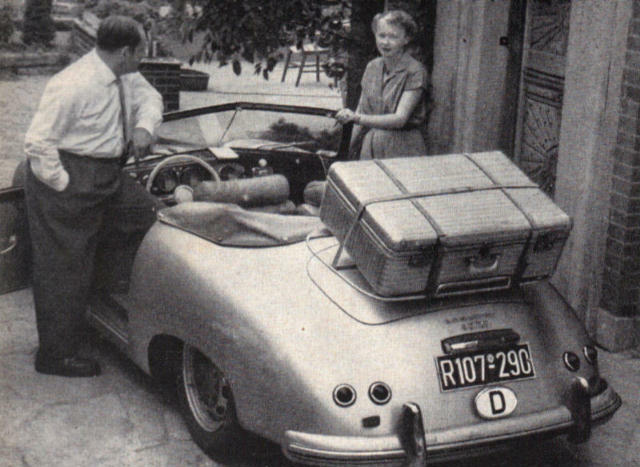 That relationship grew over the years until 1963 when Porsche acquired Reutter. 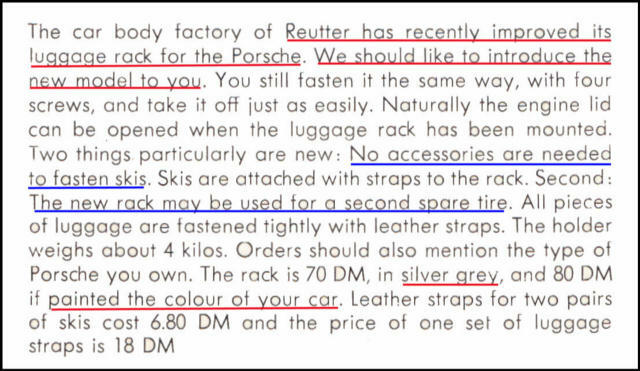 Little information is available about when Porsche first started offering luggage racks as factory accessories, or when they first began modifying the rear deck lids for mounting luggage racks without drilling new holes. 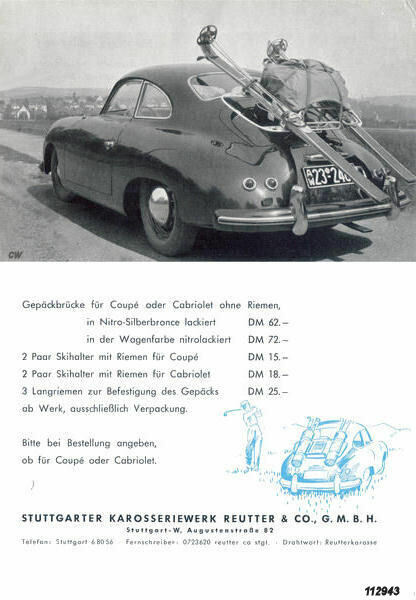 Unfortunately, the above brochure is not dated, so we can't tell for sure when these luggage racks first appeared. 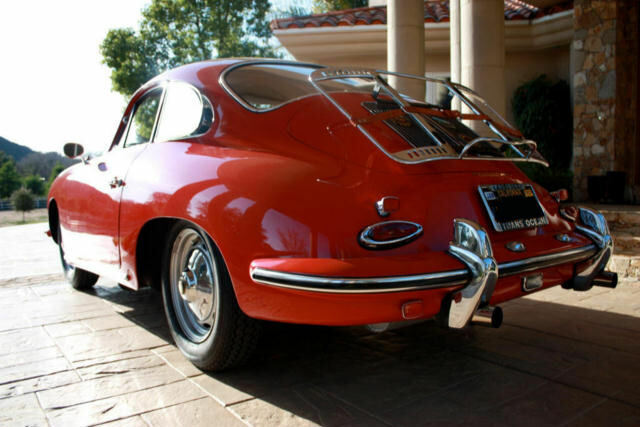 However, it is clear that they were available for 356 Pre-A's and that they were manufactured by Reutter. 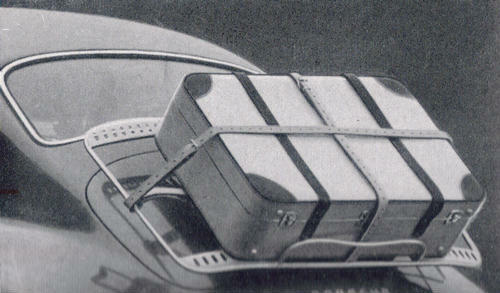 Of course, there were many numerous other luggage rack manufacturers in addition to the homemade units. 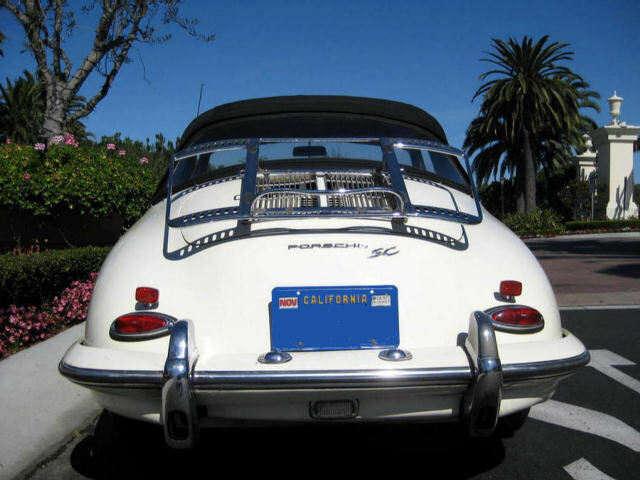 This style of luggage rack is mounted on the rear deck lid, which can be opened without problems even when the luggage rack is mounted. 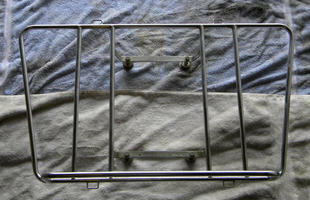 Both of the above appear to be early Reutter single grill travel racks, with some minor differences! 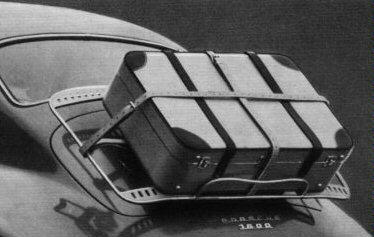 A Revised Luggage Rack by Reutter in 1956! 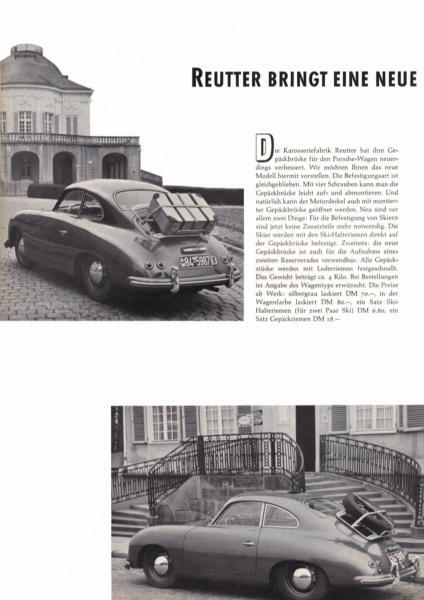 Above article from Christophorus Magazine, #1, January 1956. 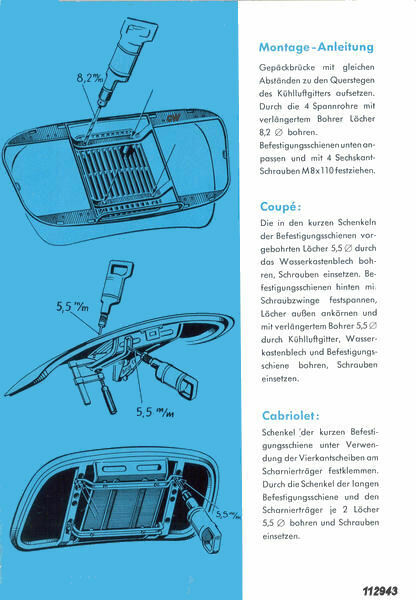 Article on Reutter Travel Racks in Christophorus Magazine #1, January 1956! 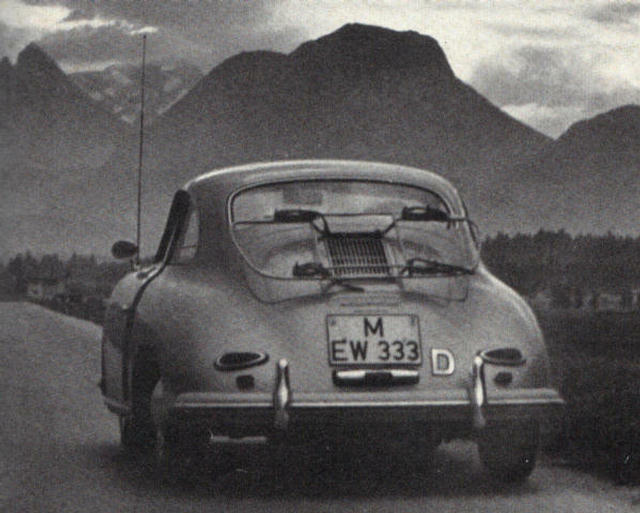 The article above first appeared in Christophorus Magazine English #1, in 1956. 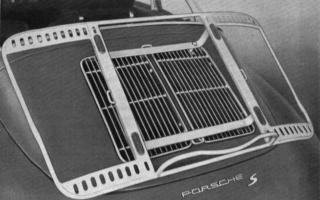 It announced a new and improved luggage rack for Porsche, which represented significant improvements over the previous model (shown above). 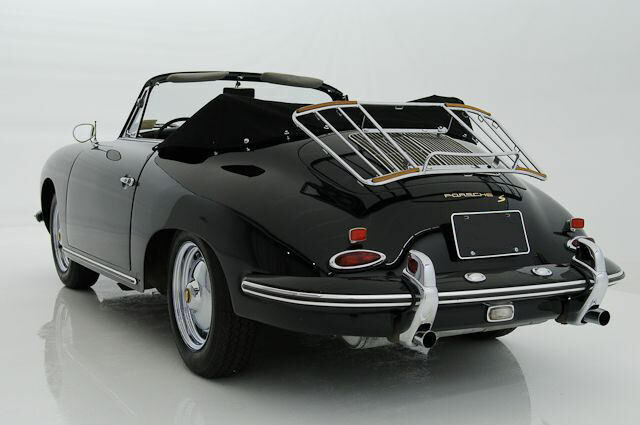 This new version came just in time for the new 356-A's which were also introduced in 1956. 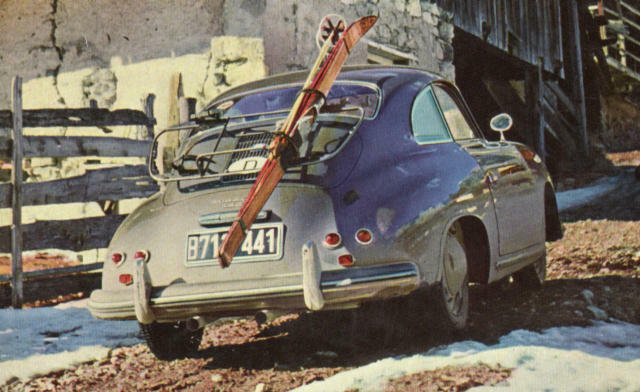 Instead of metal accessories holding skis in the earlier luggage rack, leather straps were used to hold the skis in the improved version. Also, the high bar at the bottom of the travel rack was curved to accomodate a spare wheel and tire. 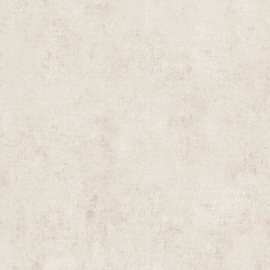 This new version could be ordered painted silver grey or the color of your car. 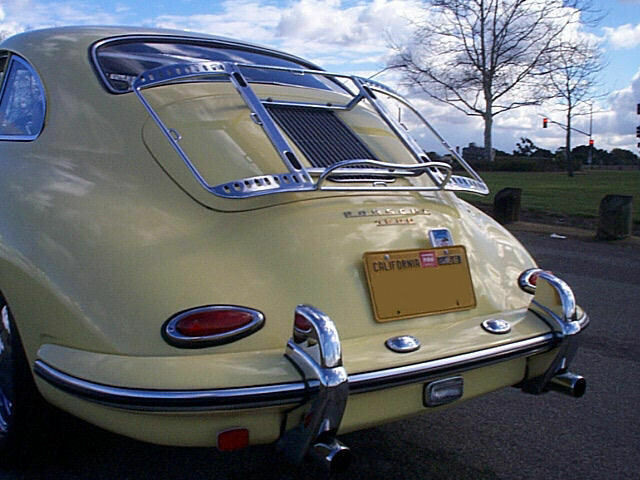 The Leitz Luggage Rack introduced in April 1960! 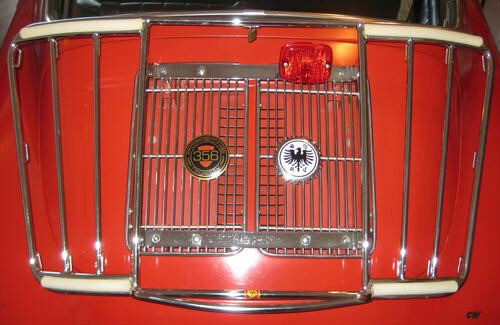 The Leitz Luggage Rack introduced in 1960 was set up for single grill 356's. What the Factory Accessory Catalogs Showed. 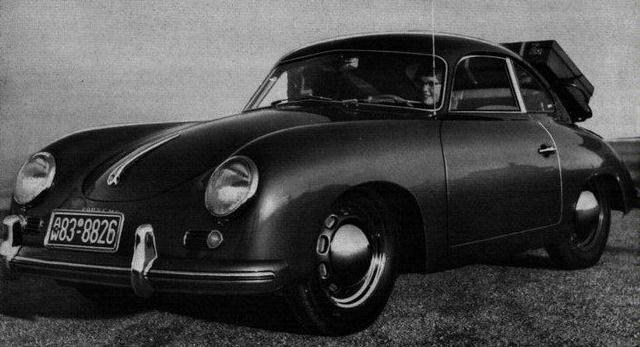 356-A (Believed to be a 1956 Catalog). 19. 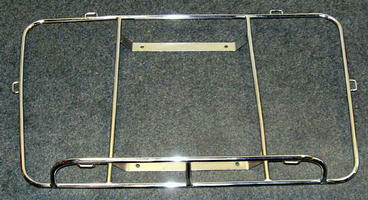 QA 38 - Luggage Rack, silver metalic finish, with tie down straps ($18.60, straps-$6.00). 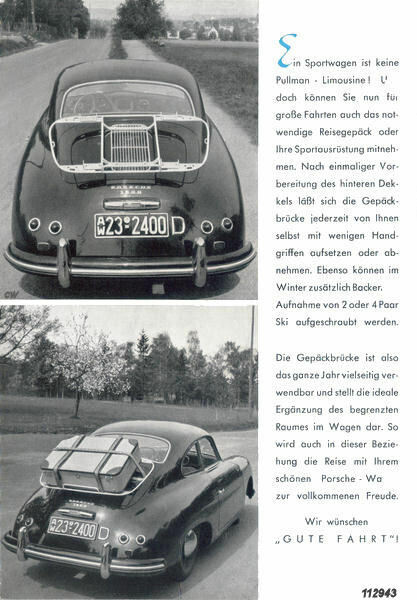 The two pictures above on the right show the same 356 as those in the Christophorus #1, January 1956 article. 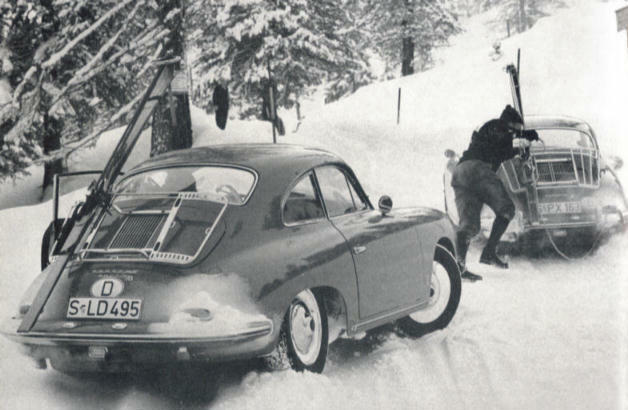 356-A Late (February 1959 Factory Accessory Catalog). 320. 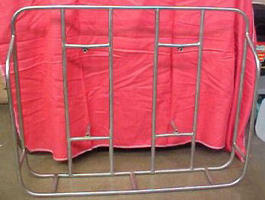 Luggage Rack, silver metalic. 321. Luggage Rack in the color of the car. 323. 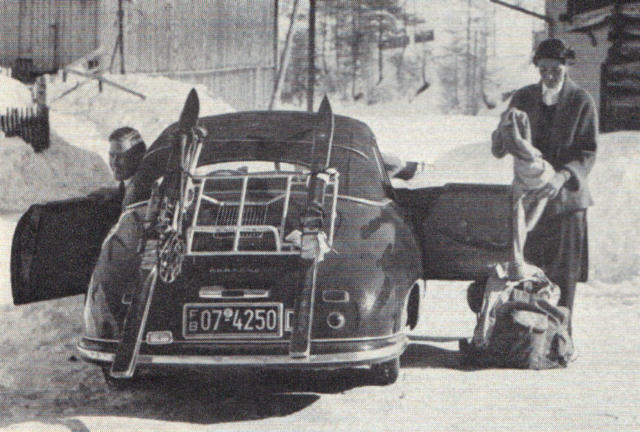 4 Straps, 2 pair skis, luggage rack. 324. 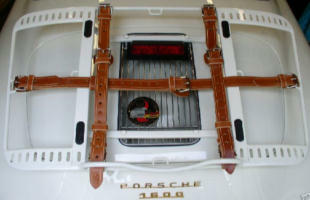 1 Set Straps for luggage rack. 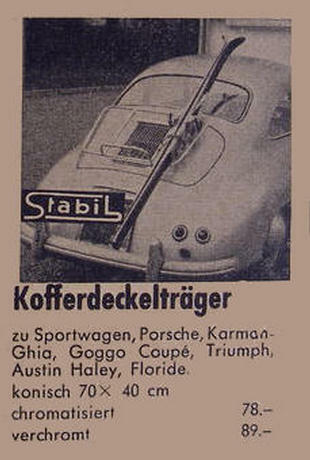 356-B T-5 (November 1959 Factory Accessory Catalog). 317. 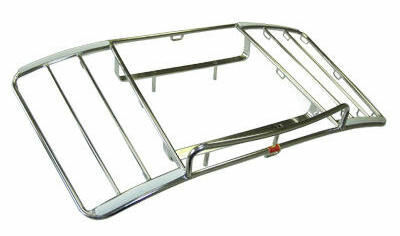 Luggage Rack, Silver Metalic. 318. 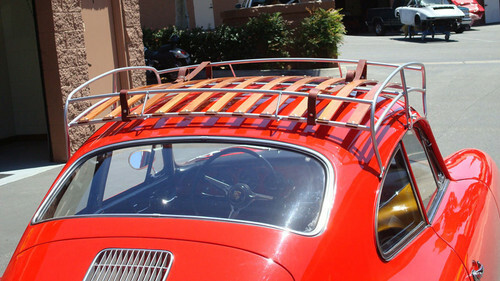 Luggage Rack in the Color of Car. 356-B T-5 Late (March 1961 Factory Accessory Catalog). 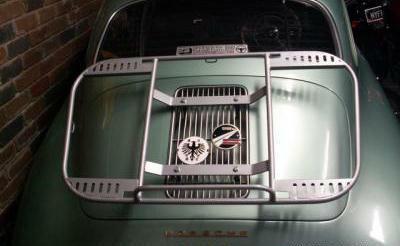 9501 Luggage Rack, Silver Metalic. 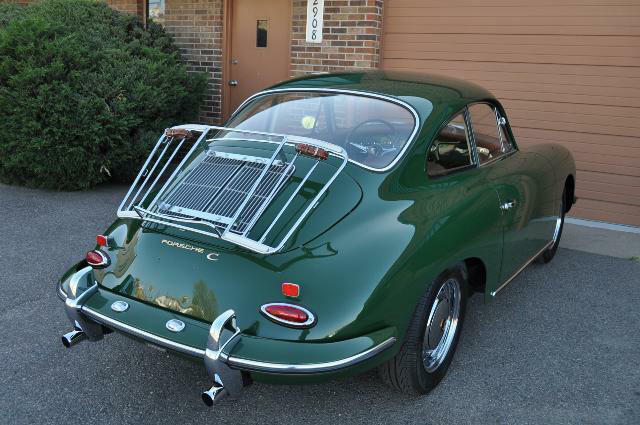 9502 Luggage Rack in the Color of the car. 9503 Straps (4) for 2 Pairs Skis on Luggage Rack. Above image not from factory accessory catelog. 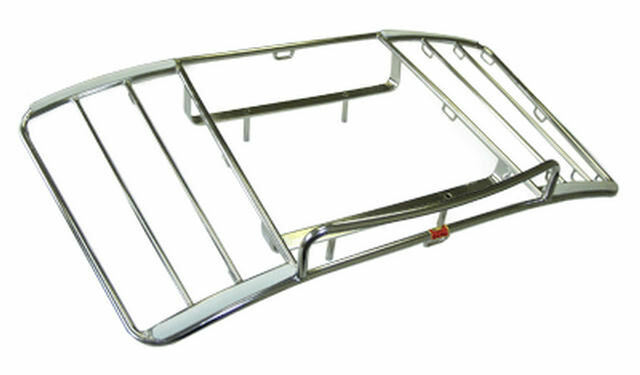 9510 Luggage Rack, Chrome Plated, Standard with 8 Ski Straps. 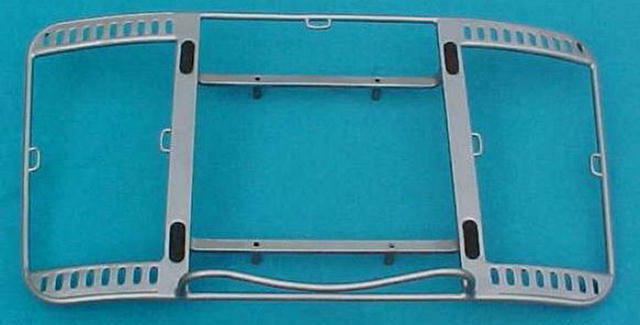 9511 Set of Straps for Luggage Rack (for Suitcase). Note: Luggage rack #9510 is the Lietz rack shown above. 356-B T-6 (September 1961, October 1962, & November 1962 Factory Catalogs). 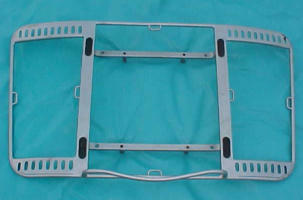 9501 Luggage rack (Reutter), silver metalic. 9503 4 straps for 2 pairs skis on luggage rack. 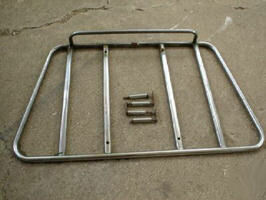 9510 Luggage rack (Lietz), chrome, w/8 ski straps. 9511 1 set straps for luggage rack, brown. 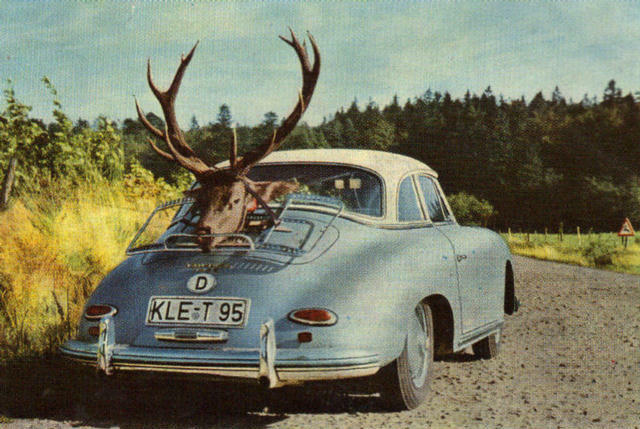 356-C (September 1964 Factory Accessory Catalog). 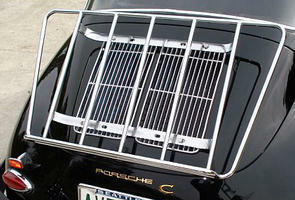 9510 Luggage rack, chrome plated, w/8 ski straps. 9512 1 set straps for luggage rack, black. 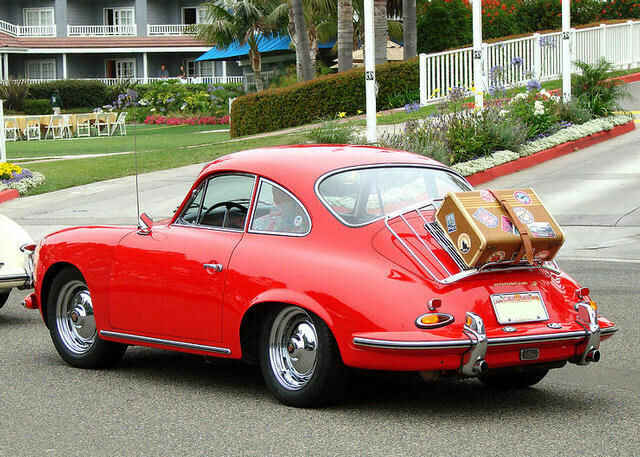 Aftermarket Luggage Racks for 356 Porsches from the 1960's! 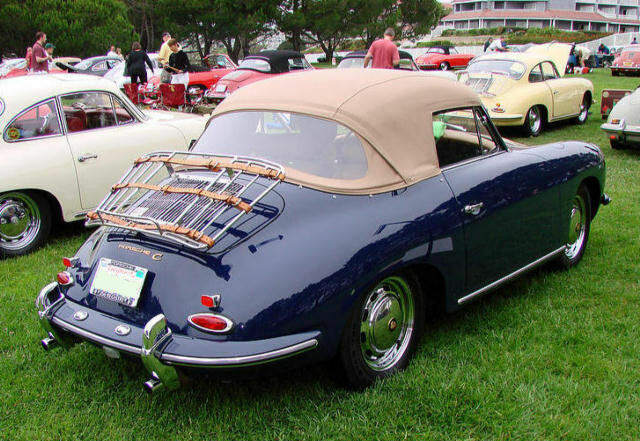 Aftermarket Roof Rack for a 356 Porsche. 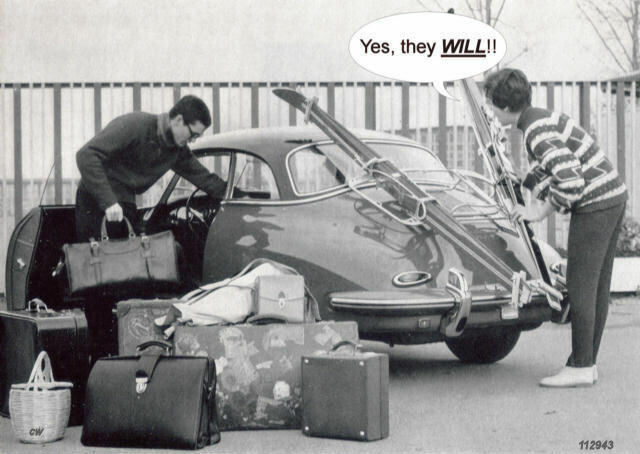 Various Luggage Racks in Pictures 1950 to 1965. 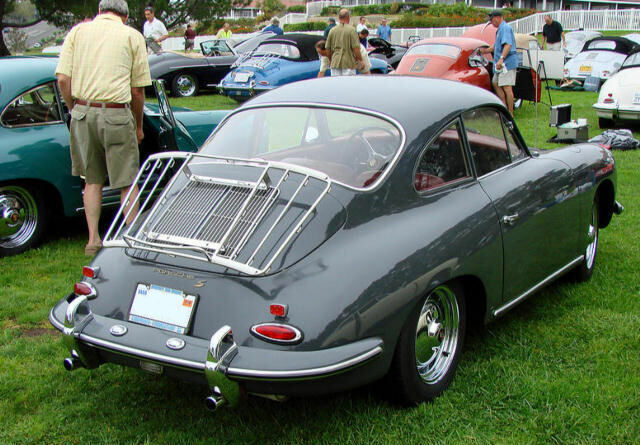 Wanted: Additional information about early 356 Porsche Luggage Racks! 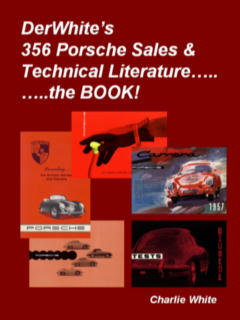 Click here and go directly to DerWhite's 356 Literature Website!